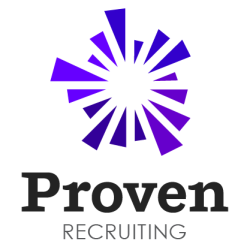 Proven Recruiting is an award-winning placement agency headquartered in San Diego, California. We help companies of all sizes hire talented professionals in Technology, Finance and Accounting. Wondering if we’re right for you? Here’s what you should know: > Our clients count on us to deliver precisely matched, high-quality talent for a wide range of direct hire, interim and  contract roles. > Our candidates choose us for friendly, supportive career representation and transparency throughout the application process. We also provide free resume assistance and career counseling for job seekers we cannot place. > While national in focus, we are global in reach. Proven Recruiting is an active member of CFR Global Executive Search, a powerful collective of international placement agencies spanning 56 countries worldwide. Still wondering? You don’t have to take it from us. Check out our 5-star rating on Yelp or email [email protected] to learn more.